After five days of egg and chorizo or brisket breakfast tacos, miscellaneous BBQ and a steady supply of cocktails, it is so very good to get back to fresher, lighter food. And vegetables. Lots and lots of vegetables. And so goes the annual SXSW detox. Fortunately for me, the fiance is trying out a new diet of eating healthier in general, including mainly plant-based and whole foods. Don’t get me wrong, I seriously doubt my resolve in avoiding juicy steaks from time to time, and fish has to stay. However, I do think that eating more fresh fruits and vegetables is always wise. Walking into FreshWorld was a breath of vibrant, healthy, fresh air. 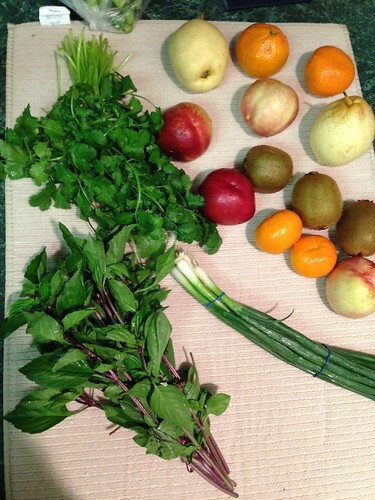 We picked up assorted fruits and herbs to get us through the rest of the week. Here they are, washed in diluted vinegar water and hanging out to dry. Fresh cilantro, basil and green onions go with everything. Nectarines, clementines, kiwi, pears and pomolo’s (not pictured) for sweeter snacks. 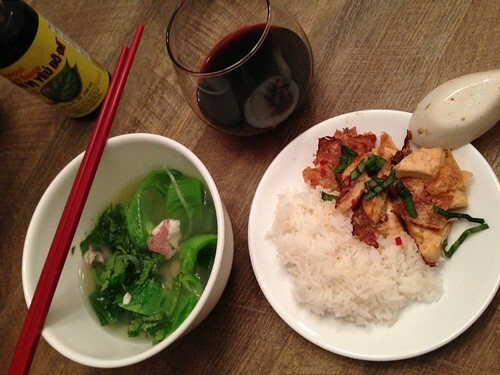 I’ve been eager to try new recipes from Andrea Nguyen’s Into the Vietnamese Kitchen, and settled on Canh cải cá rô (Gingery Mustard Greens and Tilapia Soup) to go with Sweet Chili Lime Tofu and Rice. The peppery bite of fresh Mustard Greens balanced with ginger and fish sauce sounded perfect for a light yet filling meal. SXSW is as much about technology, innovation, and inspiration as it is about food and local culture. Last night we went to a Food + Tech happy hour at El Naranjo on Rainey St – a very cool section of town with shanty houses converted to bars and restaurants. On the way out, we passed a food truck with a Hannibal-wrapped Peached Tortilla food truck that drew us in. Not to make a snap decision, we made a loop around to see what other goods may be available. Having consumed Peached Tortilla over the past few SXSWs, to I settled on Phamily Bites (truck from Houston). 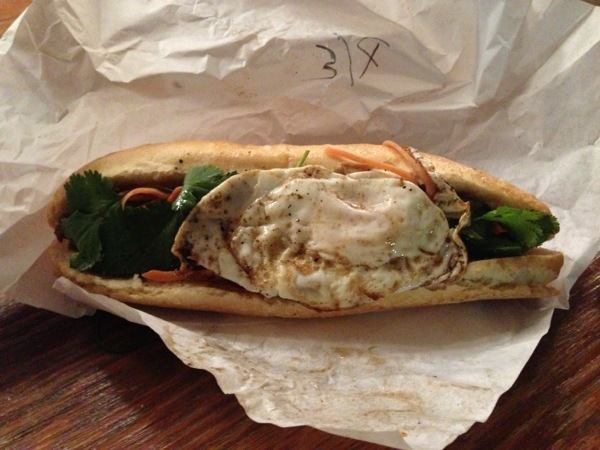 I still can’t get over paying $8 for a pork banh mi, but for you, my readers, I bit the bullet. Oh, and throw and egg on that sucker for another dollar. The verdict? Sadly not worth it. They don’t use or forgot the mayo and the bread was tough and dry. The meat, egg and veggies were great but dragged down by the poor foundation. As SXSW serendipity goes, the next event we went to at Midnight Cowboy had the good people at Peached Tortilla serving their best. 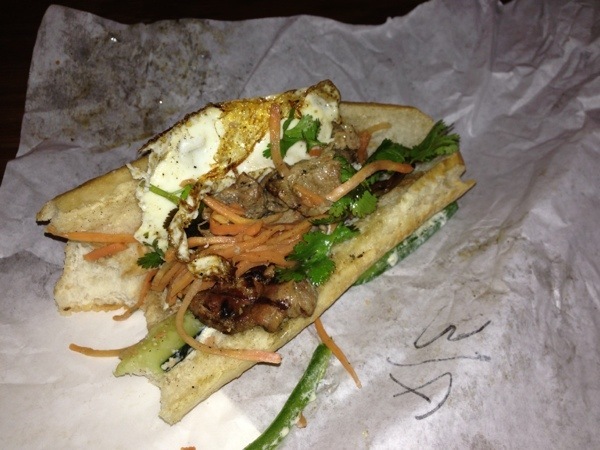 Redemption came in the form of their mouthwatering Pork Belly Banh Mi Slider. 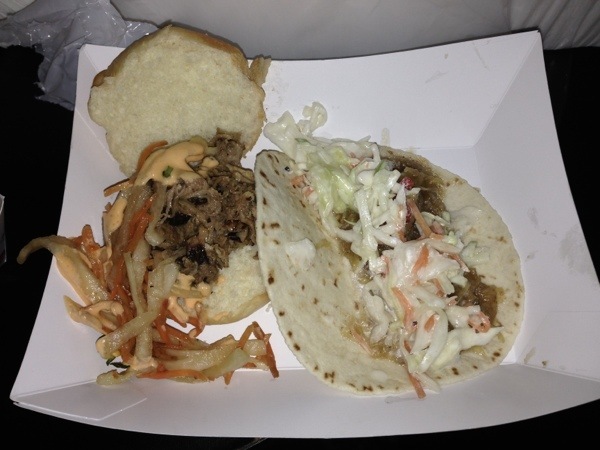 On the right is a squash taco with apple sauce – seriously so good. If you’re ever I’m Austin, find them. Eat all the tacos and the Banh Mi Slider. Everything is better with pork belly.